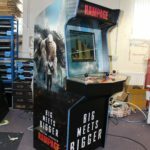 Earlier this year we saw the release of Rampage, a Hollywood blockbuster loosely based on the classic arcade game. Starring Dwayne ‘The Rock’ Johnson and Naomie Harris, the film follows their quest to save the world from the genetically engineered animals. The hit film also stars George (Gorilla), Ralph (Wolf) and Lizzie (Crocodile) who were all playable in-game characters. 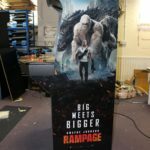 At the start of the year, we were approached by the team behind the film to create a one of a kind arcade cabinet to celebrate the new release. 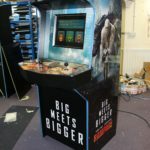 Our Evo cabinet was chosen for the job and customised with a 3-player control panel as on the original arcade. 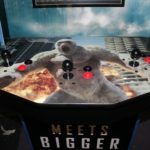 Featuring awesome movie artwork all over the cabinet as well as exclusively playing ‘Rampage’, it really did look and feel the part! 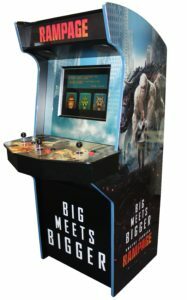 Debuting at various launch events nationwide, the Rampage cabinet was a huge hit amongst attendees! 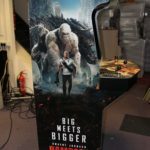 Dwayne Johnson even tweeted IGN about the epic arcade machine! Please find loads more photos of the custom cabinet below! We have previously completed similar projects for games such as Rugby 18, Yooka Laylee, Mortal Kombat, Injustice and Injustice 2. So if looking for a custom build, be sure to let us know!